Mars gets bigger and brighter – In mid to late March, the red planet Mars will get brighter and bigger in the night sky. Mars reaches opposition – its closest yearly approach to Earth – in early April, but it will start to be an attractive target in the late night hours of March. The disk of the planet will grow in apparent size from 12 arc seconds to almost 15 arc seconds as its orbit brings it closer and closer to our own planet. While almost any size telescope will show you Mars, an 80mm refractor or 6″ or larger reflector are really needed to see any detail on the planet. A filter will help bring out the elusive darker markings on Mars!Catch Jupiter in the early evening – If you haven’t sought out spectacular Jupiter with a telescope this year, now’s your chance! Gigantic Jupiter will be well placed for visual observations and imaging in the early evening hours of March. Like Mars, any telescope will display the basic features, but bigger scopes show a wealth of detail. Look for Jupiter in the constellation of Gemini and try an affordable filter to enhance contrast of the major cloud belts and the famous Great Red Spot!Get ready for Saturn – Saturn rises before midnight in the constellation of Libra and will be a good telescopic target in the late evening and morning skies of March. Just about any telescope can show the amazing ring system, and larger models will reveal the Cassini Division feature of the ringed planet. March is still a good time to see the constellation of Orion and M42, the Orion Nebula. After March, the Orion constellation will get lower and lower in the west, making it harder to see as the Sun moves eastward in the sky. The wispy Orion Nebula can easily be seen with 50mm or larger binoculars, and using a telescope will reveal more detail.Brilliant binocular clusters – Grab a pair of 50mm or larger binoculars in March for great views of the Pleiades cluster (M45), the Beehive cluster (M44), and the must-see Double Cluster in Perseus. These sparkling sky gems are simply beautiful when observed with big binoculars. By about 9pm throughout March, Ursa Major, Leo, and the western edge of the Virgo galaxy cluster are high enough in the eastern sky to yield great views of some of our favorite galaxies. Check out the bright pair of M81 and M82 just above the Big Dipper asterism. Look east of bright star Regulus in Leo to observe M65 and M66, which can be seen in almost any telescope. In the northeastern sky, check out the famous Whirlpool Galaxy (M51). While the Whirlpool can be seen with modest 50mm binoculars, using a 10″ or 12″ telescope in a dark sky site will display the distant galaxy’s beautiful spiral arms. With an 8″ or larger telescope and a dark sky this region of the sky harbors dozens of galaxies – try to find them all!Challenge object, NGC 2419, “The Intergalactic Wanderer” – In the constellation Lynx, from a location with dark skies using a good 4.5″ or larger telescope you can find NGC 2419, a globular star cluster. To make this glittering cluster an easier target to locate, we suggest a 6 or 8″ telescope, and a larger telescope is needed to resolve the cluster into individual stars. NGC 2419 is a distant globular cluster, once thought to lie outside our Milky Way galaxy.Get ready for April’s lunar eclipse! – Mark your calendars – there will be a total eclipse of the Moon on the night of April 14/15, the first in years for North America. All objects described above can easily be seen from a dark sky site, a viewing location some distance away from city lights where light pollution and when bright moonlight does not overpower the stars. All objects have been verified by actual observations. 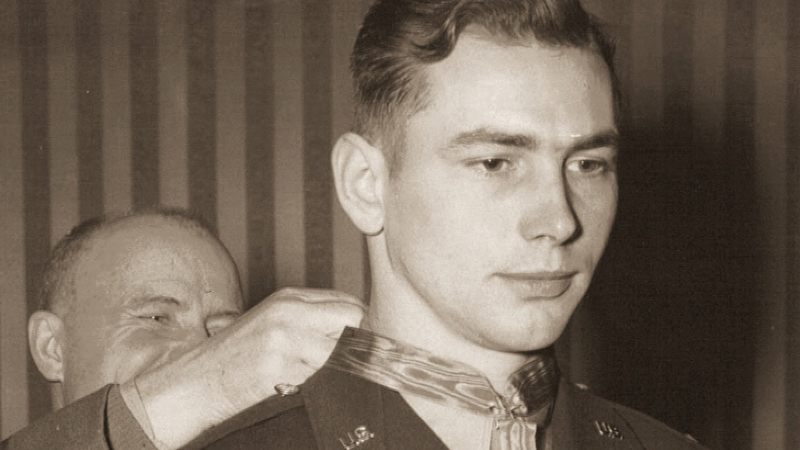 During the historic D-Day invasion of World War II, Walter D. Ehlers accomplished some of the most awe-inspiring acts of bravery imaginable, earning a Medal of Honor for knocking out two German machine-gun nests and saving countless Allied soldiers’ lives. The 23-year-old staff sergeant charged through enemy gunfire to kill seven enemy soldiers, chase away several others, put a halt to mortar fire and carry a wounded comrade to safety, even after he been shot in the back. Yet for years, Ehlers rarely talked about those accomplishments; not until word got around that it was his Medal of Honor heroics that were getting him invited to every presidential inauguration since Dwight D. Eisenhower’s. Ehlers died Thursday at a Long Beach hospital of kidney failure, his wife, Dorothy, told The Associated Press on Monday. He was 92, and his passing leaves only seven surviving World War II Medal of Honor recipients. “He never bragged about it at all,” his wife said of her husband’s wartime heroics, adding he simply told people who commented on his Medal of Honor, “I wear it for all those who didn’t come home.” That included his older brother, Roland. “He would always tell you his brother, who was killed on D-Day, was his hero,” she said. The brothers had enlisted in the Army together in 1940 and had taken part in invasions of Africa and Italy before D-Day arrived on June 6, 1944. The day before, their military superiors said they were separating them to improve the odds that at least one would survive. As the Allied boats arrived under heavy German fire, Ehlers, a staff sergeant, led his group of soldiers onto the sand. His brother, arriving on another boat, was killed. 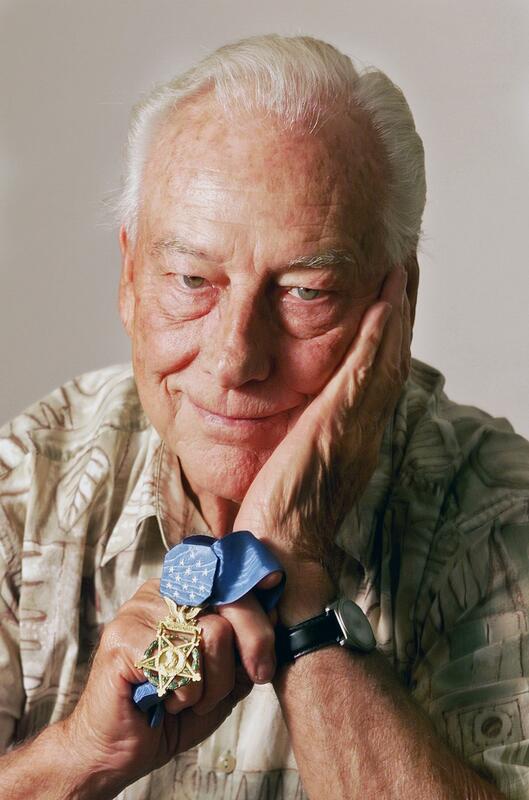 “I got all 12 of my men off the beach without a casualty, which was the best thing I ever did in my life,” he once told the Orange County Register. As the soldiers advanced, they came under heavy fire from first one and then another machine-gun nest. Ehlers single-handedly knocked out both, as well as chased away a group of German soldiers firing mortar rounds. In all, he killed seven enemy soldiers and carried a badly wounded comrade to safety after being shot in the back himself. “The intrepid leadership, indomitable courage, and fearless aggressiveness displayed by S/Sgt. 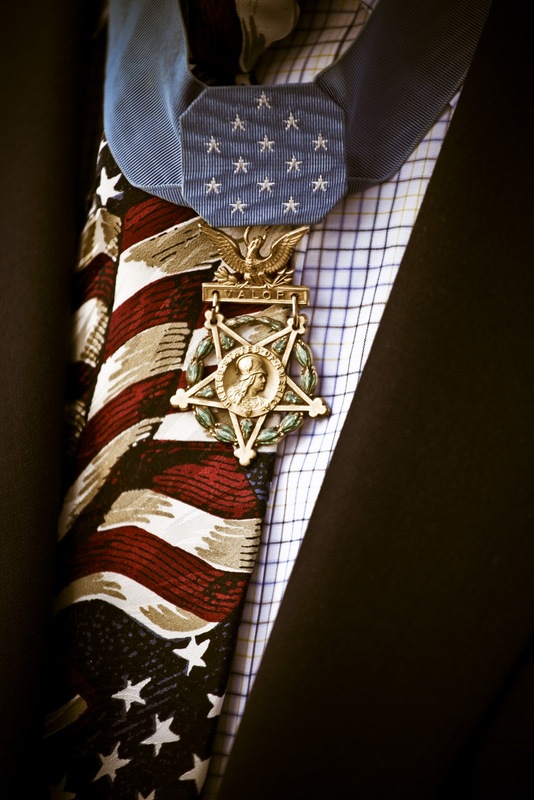 Ehlers in the face of overwhelming enemy forces serve as an inspiration to others,” his Medal of Honor citation reads. After the war, Ehlers returned briefly to Kansas, where he had grown up and where a street is named after him in the town of Manhattan. Soon afterward, he moved to California. Instead, the Buena Park resident spent many years working for the Veterans Administration as a benefits counselor. On the 50th anniversary of D-Day he returned to France, where he joined President Bill Clinton and others in commemorating the event. In addition to his wife of 58 years, Ehlers is survived by daughters Cathy Metcalf and Tracy Kilpatrick; his son, Lt. Col. (ret.) Walter D. Ehlers Jr.; sisters Leona Porter, Marjorie Gustin and Gloria Salberg; 11 grandchildren; and two great-grandchildren. Funeral services with full military honors will be March 8 at Riverside National Cemetery. February 1954 is one of Roger Hilton’s non-figurative works held in the Tate Collection, London. The artist made a number of such paintings claiming to have been influenced by the work of Piet Mondrian whose abstractions in primary colours within black and white grids he had seen in Amsterdam. The difference was though that Hilton’s work did not simply explore colour and geometry of form; one can still discern references to the human body. The works of British artists of the immediate postwar years seemed closely linked to the real world, and particularly to nature. I’ve never been interested in the Winter Olympics. I prefer my Olympic athletes to be…how you say…”more naked.” There is little to no Olympics craze here in Albania either, so most of what I know about the games comes from social media. And other than giggling at the name Bode and getting tired of hearing about how hot some Italian ice skater chick is, what seems to be dominating the news I get are the sub-par amenities at the Sochi hotels. Um…what? There was a talk about selfies at the National Portrait Gallery in London a few weeks ago (http://www.npg.org.uk/whatson/late-shift-1/panel-discussion-the-curated-ego-16012014.php), and when I was there I talked to Annebella Pollen who was chairing the session. As we were talking, anticipating the evening to come, I mentioned the fact that the same recurring themes seem to come up in discussions about the selfie. The predictability of some of these themes – ‘selfies are not photography’, ‘there are too many selfies’, and so on – interests me, as it demonstrates just how restricted the way of talking about this practice had often become. As I’ve discussed elsewhere, it’s not so much the photographs themselves, or what we even say about them, that I find important – it’s the social structures that support and are supported by such statements. 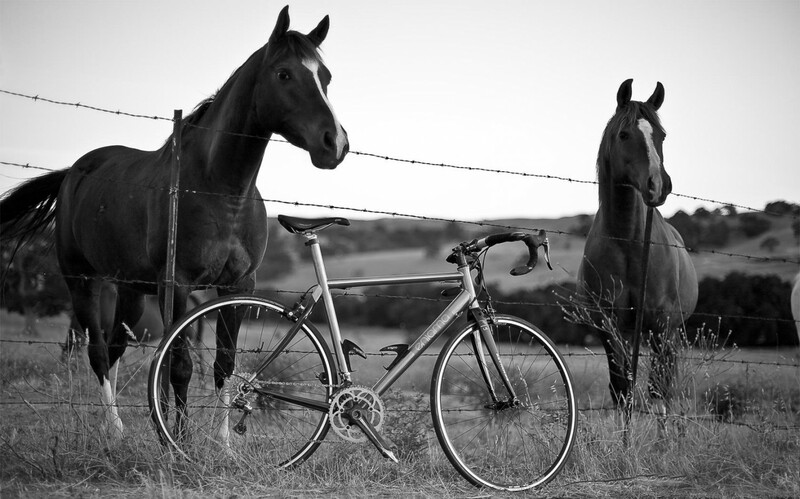 A cyclist’s special: barbecue meatloaves in muffin tins for a kid-friendly presentation that the whole family will love! Once again, another in a series of Crash-tested, kid approved meals! 1 2/3 to 1 3/4 pounds ground sirloin. 1 medium onion, cut into chunks. 2 ribs celery from the heart of the stalk, cut into 2-inch pieces. 1 large egg plus a splash of milk, beaten. 1 cup plain bread crumbs. 2 tablespoons grill seasoning (recommended: Montreal Steak Seasoning by McCormick). 1 cup smoky barbecue sauce. Vegetable oil or extra-virgin olive oil. Micro-way-cool Bacon and Green Beans. Smashed potatoes and cream cheese. Put ground beef into a big bowl. Put onion and celery into a food processor. Cut the bell pepper in half, rip out the seeds and throw them into your garbage bowl. Cut the pepper into a few pieces and add to the food processor. Pulse the processor blades to finely chop the vegetables into very small pieces then add them to the meat bowl. Add egg, beaten with milk, bread crumbs and grill seasoning to the bowl. Next, mix together the smoky barbecue sauce, the salsa and the Worcestershire sauce. Pour half the sauce mixture into the bowl with the meatloaf mix. Mix the meatloaf together with your hands. Wash up. Brush a 12-muffin tin (1/2-cup each) with vegetable oil or extra-virgin olive oil. Use an ice cream scoop to help you fill meat into a each tin. 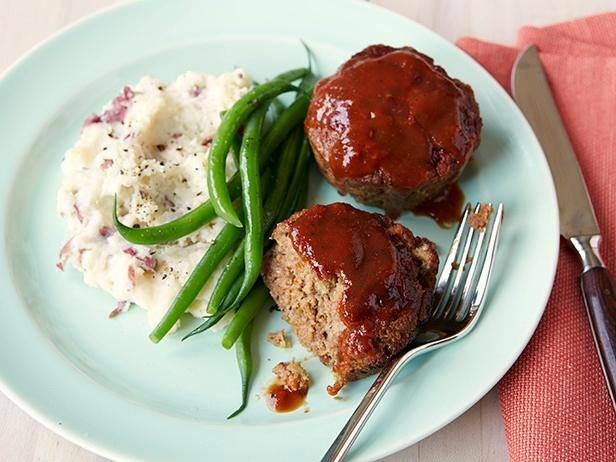 Top each meat loaf with a spoonful of extra sauce. Bake about 20 minutes. Cut open 1 muffin to test that the middle is cooked through. While meatloaf muffins bake, make green beans in the microwave. Serve meatloaf with Smashed Potatoes and Cream Cheese on the side, too.